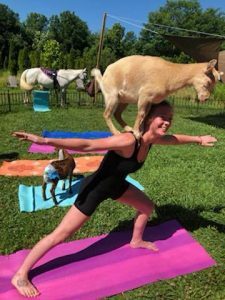 There is a new Horse Yoga Farm that has just opened in Maple Glen offering baby goat and horse yoga. Horse and Goat Yoga is a rescue-based organization, and it’s proceeds help the rescued baby goats and horses have a second chance at life, while also preserving farm land and giving them a new purpose. Many of the animals are available for adoption as well. Lars Taboga, owner and operator of the Horse and Goat Yoga Farm, tells us that there are a variety of Horse and Goat yoga classes, most of which are offered on the weekends. On select Friday and Saturday nights the farm will offer a Bahh Sip and Play event where people can stay after class feed the goats baby bottles, learn how to milk a goat and try it themselves. The farm will also be doing a bonfire with a lanolin extraction demo from the sheep’s wool. People can have a fun night out on the farm learning about the horses and baby goats, get to feed them bottles, play with them, brush the horses, and snuggle with the goats by the fire. Please visit the Horse and Goat Yoga website for a full class schedule and to reserve a spot. The baby goat yoga is very cute and fun. 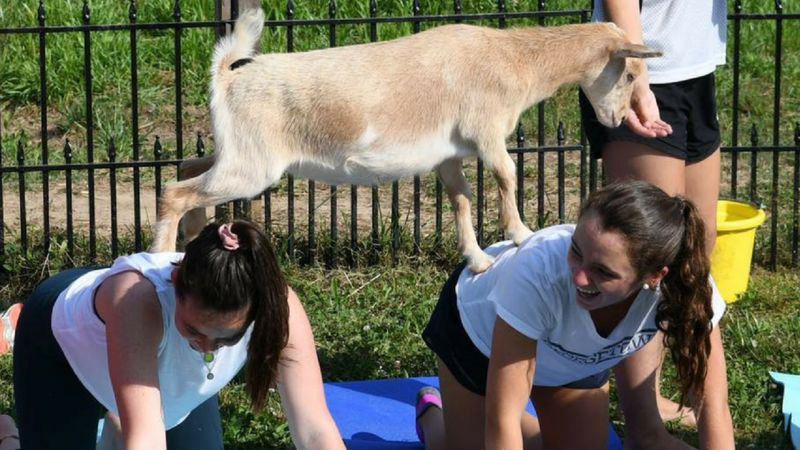 The baby goats love to jump on the yogis while doing yoga and they even jump from one yogi to another and they do crazy funny moves! The babies are feed bottles too! They also love to snuggle and give kisses! The horse yoga is very relaxing. The horses are very quite and calm and it gives people an opportunity to connect with them on a whole new level! It’s great for beginners to develop balance or seasoned riders to work on relaxation and connection. The Horse and Goat Yoga Farm is located at 1537 Dillon Road in Maple Glen.